Well it's about time we got some sweater talk here, no? Seems like it's been forever! Today's sweaters are two near and dear to me -- probably because I love wearing them both so much. So I'll state the obvious: I am in love with colorwork. I can't not do it. It's a compulsion. I love graphic motifs and patterns and pairing yarn colors. The sheer amount of possibilities makes my head swim. So I decided early on to just go with that and indulge the colorwork factor this year, and these two pieces pulled me right back into that vortex. Indulgent indeed! This is one of those epic patterns I catch myself daydreaming about on the subway but rarely realize. 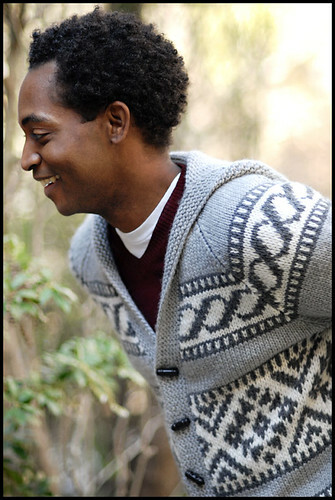 It started out as an oft and intense wish for a classic Cowichan Cardigan -- traditional bulky wool sweaters featuring animal and geometric patterns, knit by the Cowichan Tribes of the Pacific NW and Western Canada. Traditional Cowichan patterns are worked with thick, bulky wool and often sport dramatic shawl collars worked in garter stitch (sounds good right?) - here are some examples. I made some changes to my inspiration but would be lying if I told you that this design didn't come directly out of this sweater genre! Ariosa is a chunky merino/cashmere single, very lightly spun (almost roving-like) which keeps this cardigan from becoming too heavy. It's oddly soft for something that looks more like rustic outerwear. I traded a shawl collar for a hood, cause you know, hooded cardigans are always welcome here. As for the knitting - the sweater is steeked (cut) down the middle to open up the front, which means all this colorwork patterning is knit in the ROUND (intoxicating!) - if you were worried about working stranded colorwork from the wrong side, rest assured we'll be having none of that around here. I did a machine-sewn steek rather than my usual crochet method, because merino and cashmere are short-stapled, slippery fibers and need to be well enforced to really stay put. Actually, this was the first time I had ever worked a steek with a sewing machine. I guess it's not so terrible after all (despite my still-strong fear of bringing machines close to my unfinished knitting - although I do remember thinking at the time that the hammering needle resembled a small battering ram). There's a funny story about this one. Prior to giving an official name to this sweater I was referring to it as the Pinch Hit. 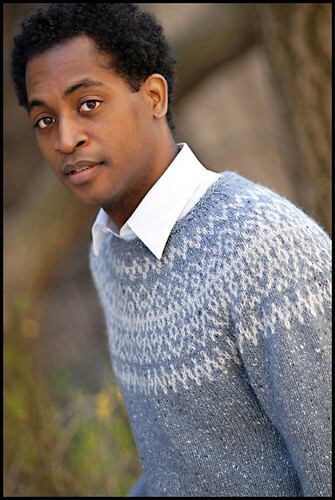 See, there was another sweater slated for this book, back when Huron was a mere scribble in a notebook somewhere. The other garment just wasn't working for me - it didn't feel right and it didn't fit in, and time was running very short. With 8 days left before my deadline, and an unflappable feeling of defiance ("I won't lose to you, Problem-Sweater!") I thought throwing in another, completely new, completely unworked-out sweater design was somehow a good idea. In retrospect, I'm glad I did, but... that was a rough week. Aside from calling up CE for a last minute shot of yarn, I don't remember much from that period, other than that Huron was born from start to finish in about 6 days. But I guess when you're knitting yourself silly on a garment deadline, you can't ask for something much better than a seamless stockinette pullover with a colorwork yoke. Just when I thought I couldn't take any more stockinette (something I almost never say), the stranded portion swoops in and saves the day. Live and learn I guess. The funny things is, I wouldn't mind knitting this again. I didn't feel like I really got to enjoy the knitting to its fullest because of said insane-situation (kinda like inhaling a gourmet meal way too fast to enjoy it). Round yokes are hard to beat on my list of favorite project types. Anyway - it's here, nonetheless, which is what really matters I guess. As for the other, sidelined sweater, it'll have its time in the sun. Someday. Just not today. I am so enjoying getting the backstory behind each of the designs in your book! I really like both of these designs...round yokes are pretty hard to beat on my list of favorite project types, too. This is MUCHO exciting!!! Thanks! I can not wait to get my hands on this booklet. 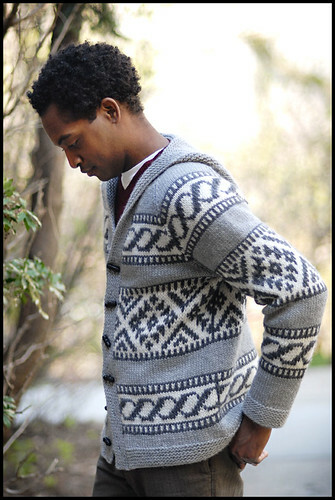 I've wanted a cowichan sweater since i was little kid in Saskatchewan. I love the look of the lighter weight version. Huron is a very good save. And I'm not usually seduced by light blue. Aw shucks Jared. It's great having you back in blog land. Perhaps Mr Conservative Bloke would let me knit him THIS one (Huron). Ah, lovely. As always, I admire your fabrications, Jared. Rockaway reminds me a bit of The Dude's sweater in "The Big Lebowski". The patterns are completely different, but the spirit is the same. The Rockaway is irresistible. The colors and the design worked so perfectly together. I am a big fan of hoods too. But I can only dream with the day I will be doing such a big project. 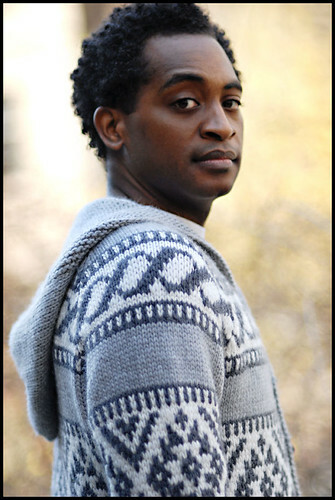 And the Huron... oh my... a complete sweater, so rich and elegant in 6 days!!! Did you realize how insane is that?! You really are very gifted! I don't know who is more gorgeous--the sweater or the model! What a beautiful pairing! Absolutely gorgeous and very exciting to see. Can't wait for the book! Thank you for the stories behind the designs. Thanks for dividing the book up this way, and for profiling each item. I love Huron and it looks like one I'd make for my Xmas tree farmer husband! Thanks! Huron is a beautiful sweater! I love knowing the stories behind the projects. The sweater-that-almost-wasn't may be my favorite! I cannot wait for the next installment, maybe it will feature my newest queue addition: Seneca! oh my. rockaway rocks my world. think mr long & tall in black would go for it? Oh my. They are beautiful. I am in awe of you taking the best of Cowichan and colorwork and making them your own. The edges! - cuffs, hems, neck and the inspired addition of the hood. Stunning and so wearable! These are both great, along with everything else in the book! I'm looking forward to making several projects out of it. Well done! very cool and stylish. both. I love that last sweater. I'm thinking that with a little shaping in the stockinette it would be a wonderful women's sweater -- though I might have to make it purple for the fun of it. Wonderful!!! I'm looking forward to attempting the first one! Both sweaters are SO magical and beautiful. I can only dream of being as gifted a knitter as you are someday. WAY in the future, perhaps after my son, now 18 months is in college? Bravo for doing the second one in only 6 days!!! Congrats again on your wonderful designs. Huron looks basically perfect -- I can't wait to learn colourwork! Lovely as always, I am a big fan of your knitting. omg, beautiful wool, beautiful designs, beautiful photography, beautiful men! So much beauty coming out of Brooklyn! These are beautiful. I have been looking for good patterns for my husband for Christmas and these are so inspiring. Finally something besides a basic ribbed sweater! Love your blog! You are positively amazing. I love all your patterns and have followed your blog for several years now; so I must ask, Jared, do you ever sleep!?!? LOL Keep on knitting. LOVE LOVE LOVE these sweaters!!! You've got great ideas! Love the colors you choose as well. Trendy and classic all at once! It sooo nice to see a man making patterns for men! I love both sweaters. The Rockaway is so tempting but the steeking scares me; especially since I don't have a sewing machine. I will definitely put the Huron in my Ravely queue. The names of these sweaters make me homesick for Brooklyn. 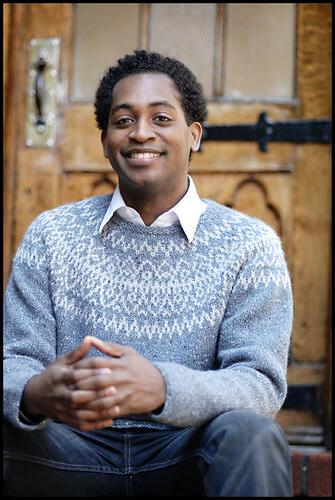 I hope to see/meet you when you are in the Seattle area at Churchmouse Yarn in Nov.
Congrats on finishing your MFA! Your is on the way to Atlanta for me. I love your work and I know that the instructions will be clear. I'm a self taught knitted and I have to sometimes labor over sorting out a pattern. I knitted the Hemlock Ring with a bit of stress but I've learned a lot and continue to love knitting. Thank you for the book. I can't wait to get it. I LOVE the first sweater. Really gorgeous. Just fabulous! Thank you for the details on the design. Love your work! Fantastic! Always great to have interesting patterns for men too--they are queued! gah! i love all the names of your sweaters. i was just up in brooklyn visiting one of my friends who lives in bedford so i recognize all the street names from our subway travels! love rockaway! I really like this design. 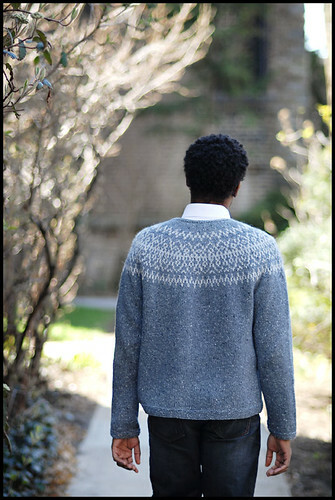 These sweaters have a fair isle feel to them, but the color is very masculine. I really like it.